Reports from the United States indicate that the four-day visit to Guyana by a contingent of Florida-based businesspersons seeking to establish trade ties with Guyana has left the delegation upbeat about the prospects for inking firm deals with their Guyanese counterparts that will open up new opportunities for local goods on the North American market. 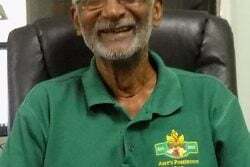 The mission, organized by the Outreach Aid to the Americas (OAA) Inc in conjunction with the Guyanese American Chamber of Commerce (GACC) was the latest in a series of ongoing efforts to create firmer business links between Guyanese entrepreneurs and merchants in North America. 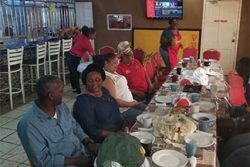 Stabroek Business understands that this trip afforded the opportunity for the visitors to become more familiar with the rules and practices associated with establishing trading links with Guyana as well as arriving at a determination regarding goods and services available for export. 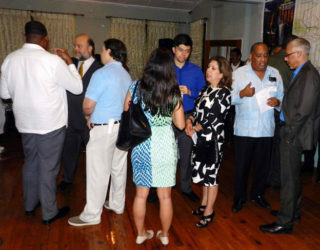 Visiting business group from Florida at an informal meeting at Roraima Duke Lodge Hotel, Kingston. Also in photo are: US Ambassador to Guyana Perry Holloway (second, left) and Business Minister Dominic Gaskin (far right) conversing with mission leader Wesley Kirton. 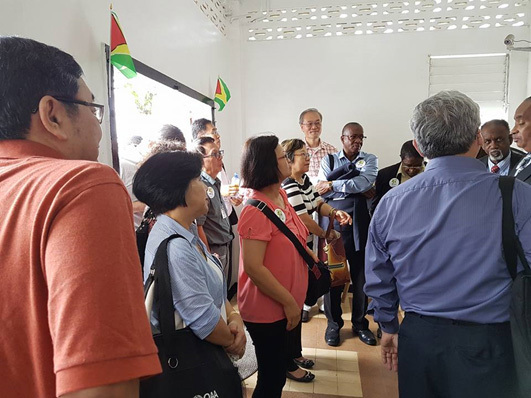 Owen Verwey, Chief Executive Officer of the Guyana Office for Investment (GO-Invest) the local agency responsible for directly handling external business and investment enquiries, was one of several state and business officials who met the visiting delegation. 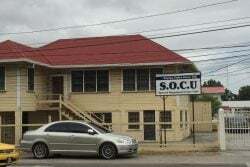 The list of state officials and private sector entities and business support organizations with which the visiting delegation met include the Minister of Agriculture, the Guyana Sugar Corporation, the Guyana Rice Development Board, the Georgetown Chamber of Commerce and Industry, the Guyana Manufacturing & Services Association and the Linden Economic Advancement Programme. Stabroek Business understands that the principal interest among the visiting businesspersons reposed in such opportunities as exist for the export of selected items of food from Guyana and that the outcomes of the initial encounters led to some members of the delegation remaining in Guyana to extend the initial business exchanges. 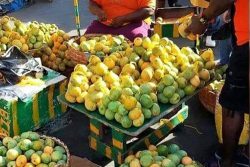 Reports from South Florida monitored by this newspaper indicate that a number of initiatives have been identified for follow-up action including expressions of interest by the visitors in the acquisition of pork, seafood, rice, fruit and vegetables from local sources. This newspaper understands that the mission also probed the possibility of an electronics assembly plant and the setting up of a plant to manufacture plastic containers. Arising out of meetings with Chief Executive Officer of Roraima Airways and Wedding Expo Gerry Gouveia, an understanding has also been reached on joint efforts to promote Guyana as a ‘wedding destination’ among South Florida residents and for the continuation of initiatives to secure the services of major airline and shipping companies to better serve Guyana’s trade and travel interests.